A recent HBR article described a 2016 study examining the forecast rate of digital disruption. 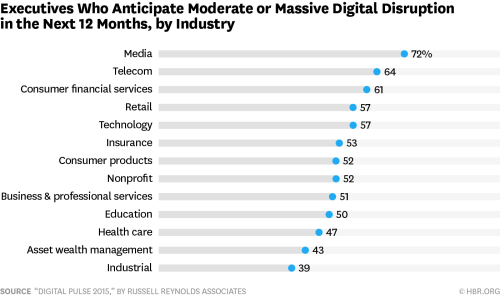 Executive search firm Russell Reynolds surveyed 2000 C-level executives in 15 industries, asking them to describe the expected rate of digital disruption during the coming 12 months. Executives expect digital disruption to be the most severe in B2C industries, particularly in media. 57% of Technology execs expect moderate or massive digital disruption. My personal conversations with chief customer officers (CCOs) confirm that B2B industries are not far behind. Oracle, facing considerable pressure from SaaS providers and other competitors, recently moved 90% of their business to the cloud. The research indicates that industries most vulnerable to digital disruption are those that have low barriers to entry and are comprised of large companies with legacy business models. Digitally agile competitors gain greater economies of scale and capture greater value by automating expensive processes. A recent McKinsey survey of 1,000 B2B decision makers said that approximately "86 percent of respondents said they prefer using self-service tools for reordering, rather than talking to a sales representative." Thus, many digitally agile competitors are providing self-service re-ordering and saving money while providing a better customer experience. Where are you at? I'd love to hear how would you answer the same question: In your industry, what level of digital disruption are you expecting during the coming year: none, low, moderate, or massive? P.S. Next question: would it be valuable to have a discussion about where you need to go next in your digital transformation? I've created a comprehensive digital assessment that benchmarks against the world's leading companies in six critical dimensions and gives you a prioritized roadmap going forward. I've partnered with Bob Taylor, former CCO of Samsung SDS and present CDO of from.digital, a digital transformation agency to bring this to you. If you'd like to discuss, please call me at 978-226-8675 or email curtis@ccocouncil.org. Copyright © 2019, Chief Customer Officer Council. The ONLY newsletter geared exclusively to the CCO. Learn best practices & critical strategies to drive solid business results.